Warning: It may be dangerous to read blogs with your credit cards within arm's reach. As part of the POPSUGAR 2015 Blog Influence Report, we partnered with CJ Affiliate by Conversant to understand the role that blogs and bloggers play in women's shopping and purchasing decisions by surveying over 2,500 visitors to POPSUGAR and ShopStyle. 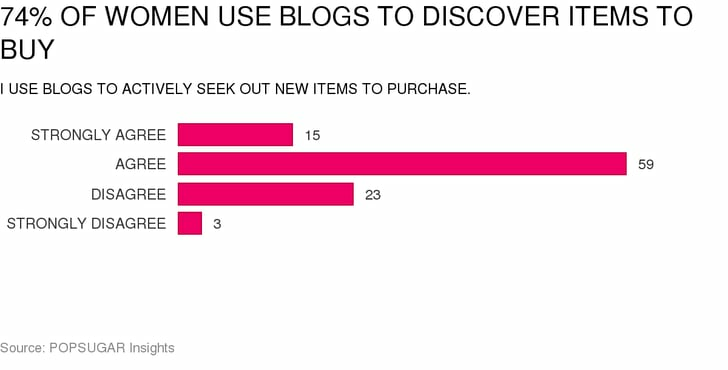 We learned that 74% of women use blogs to actively seek out new products to purchase and 71% of women have purchased an item immediately after discovering it on a blog they read. In this case, product reviews by bloggers can be especially persuasive conduits to impact purchasing behaviors, with 91% of women saying they have purchased an item they were actively considering after reading a positive review of the item on a blog. Nearly one in four women strongly agree that positive reviews sway them to purchase the product.